The King Abdullah II Design And Development Bureau (KADDB) presented a number of interesting new developments at the SOFEX 2016. The al-Dawsar heavy armored personnel carrier (APC) is based on the hull of the obsolete Tariq main battle tank (MBT), itself a local version of the British Centurion tank, retrofitted with an US AVDS-1970 diesel engine and a relatively modern fire control system (FCS) from the Belgian company SABCA. The Tariq also features an improved suspension aswell as turret drive and stabilization systems from the US company Textron. Overall 293 Centurion tanks were converted into Tariq MBTs, however with the adoption of the Chieftain, the Khalid tank (an improved version of the Chieftain originally intended for Persia, it features the ICSS FCS and Condor CV12 engine later adopted on the Challenger 1 tank) and also ex-British Challenger 1 tanks, the Tariq tanks have become obsolote. In an attempt to reuse the already existing hulls of the Tariq, the KADDB has been developing a heavy APC based on the Tariq chassis since several years. 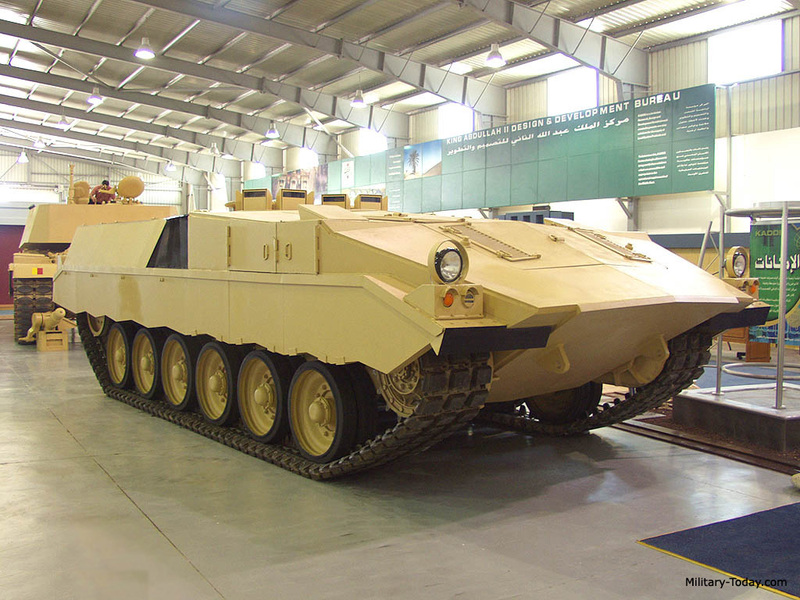 In 2001 the KADDB revealed the Temsah heavy APC, which was a Tariq hull modified by the KADDB in cooperation with companies from the UK and South-Africa. 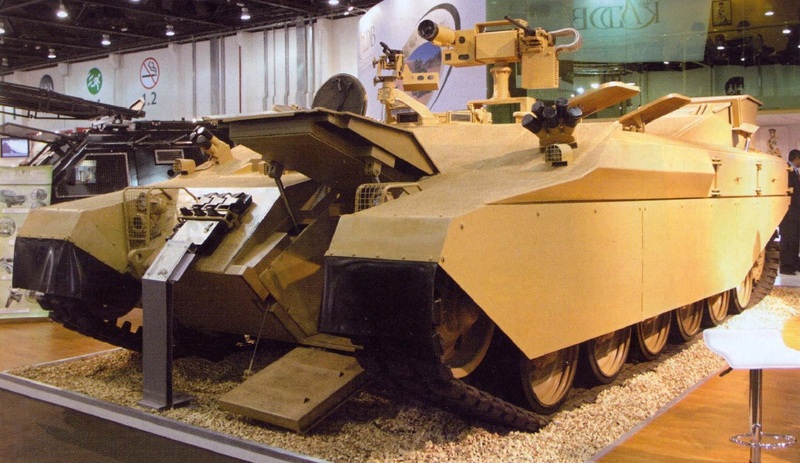 The Temsah has a front-mounted powerpack, which allows the usage of a rear ramp like commonly found on tracked APCs like the M113 and infantry fighting vehicles (IFVs) like the Bradley, BMP and Marder. A prototype of the Temsah HAPC. The Temsah however was never ordered nor adopted in any form. The prototypes have been fitted with numerous different weapon systems including machine guns (MGs), autocannons and anti-tank guided missile (ATGM) launchers. The MAP II/Dawsar APC. The front door and hatches are open, the rear door is folded up (at the right). Following the Temsah and it's end, the next project for re-using the Tariq MBT was the Modular Armored Platform, MAP. The MAP II was finally adopted in 2014 as (al-)Dawsar. Unlike the Temsah, the MAP APC retains the rear-mounted powerpack with the AVDS-1790 engine, but has a small rear door together with a path at the left side of the powerpack. When not folded up, the rear door has a height of only 450 milimetres (mm). A larger 750 mm wide and one metre tall front door is located at the frontal hull, slightly moved to the left. Four hatches of 500 x 550 mm allow access to the roof. Overall 11 soldiers and 2 crew members can be carried inside the MAP II APC. The armament consists of two MGs with an option for a missile launcher. It provides protection against medium calibre ammunition. The MAP II has been nicknamed "al-Dawsar". The upgraded al-Dawsar design presented at the SOFEX 2016 has yet to enter service, but it has a number of improvments over the previous model. While the drivetrain and powerpack are still identical to the older Tariq MBT, the armor has been improved compared to the MAP II by adding a further layer of spaced armor, probably to increase protection against KE penetrators. Unlike the MAP II, which has a 450 mm (1.5 feet) widened hull, the al-Dawsar has retained the standard Centurion hull width - this decrease production costs and time, but results in a smaller vehicle. Unlike the MAP II, the al-Dawsar from SOEFX can only carry 7 dismounts and a crew of two, although an alternative seating arrangment might increase the number of dismounts. It doesn't have a rear door. Protection is provided in accordance with STANAG 4569 level 5 against kinetic energy ammunition (resists 25 mm APDS at the frontal arc), but only level 1 against mines and IEDs, which seems rather poor. Another new development presented by the KADDB is a new 8x8 wheeled vehicle. It's design in form of a scale model was first presented at the DSEI 2015 exhibition in London, but no prototype. With a total weight of 25 metric tons (depending on armor and mission configuration), the new vehicle can reach a top speed of about 100 kilometres per hour (kph). The total range lies at about 700 km. In general the KADDB 8x8 wheeled vehicle design seems a bit lacklaster compared to offerings from European companies, but should perform rather well in the regional context. It does have 4 wheel steering only and it's independent tetra back bone suspension is very similar to the ones currently used on civil Tatra trucks, it seems likely that there is a connection. The dismounts of the APC version can fire their individual weapons through firing ports - one is located in the rear door, while four firing ports are located at each side of the crew compartment. This is an interesting feature, but very old fashioned. The firing ports are embedded into bullet-proof glass. Firing ports have been abandoned by other vehicle manufacturers, as they are weakspots that lower the armor protection of the surrounding area. No details about engine, performance and armor protection have yet been released. However at a weight of only 25 metric tons, a protection level larger than STANAG 4569 level 4 against kinetic energy (protection against 14.5 mm AP all-round) seems to be very unlikely. More likely seems to be only protection in accordance with level 3 (protection against 7.62 mm AP all-round) together with protection against 14.5 mm AP along the frontal arc seems more likely given the firing ports. The v-shaped hull and high overall ride of the crew should give the vehicle a rather high level of mine proteciton. The KADDB announced at DSEI, that they are interested in developing multiple variants including an APC version, an IFV and a tank destroyer/fire support vehicle with 105 mm gun.